Review: Holes. Nottingham Playhouse. – East Midlands Theatre. 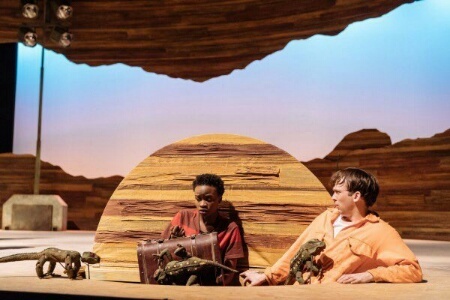 This delightfully magical stage adaptation of Louis Sachar’s popular novel Holes at Nottingham Playhouse – Sat 31st March – Sun 22nd April 2018 – entertains the whole family in spades and the adaptation unearths many a theatrical treasure en route. Whilst many a family show outside of the annual Pantomime is relegated to a smaller studio space, Nottingham Playhouse and artist director Adam Penford have broadened the vision of their programming in 2018. 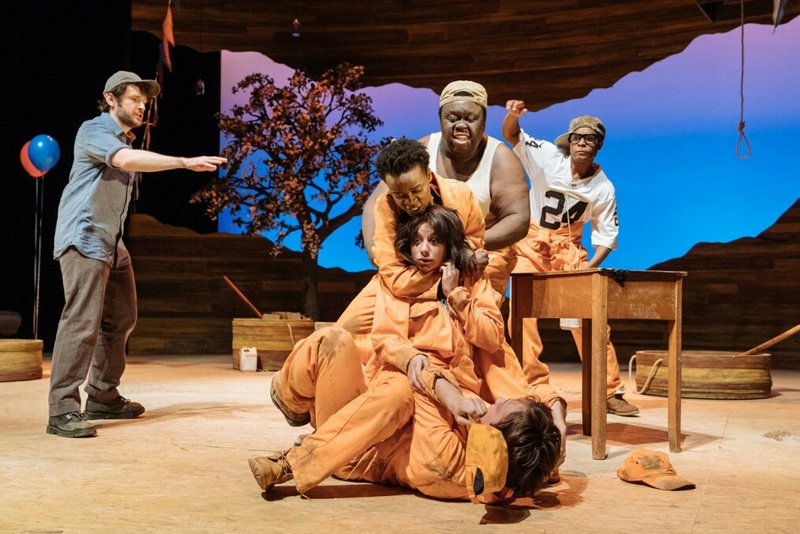 Therefore, with this main stage production of Holes they bring their ‘age unlimited’ audience a glorious new experience and Nottingham Playhouse a wider artistic and family friendly perspective. Plus, the dates of the run for Holes have been lengthened giving families and individuals more chances to enjoy this most excellent show. 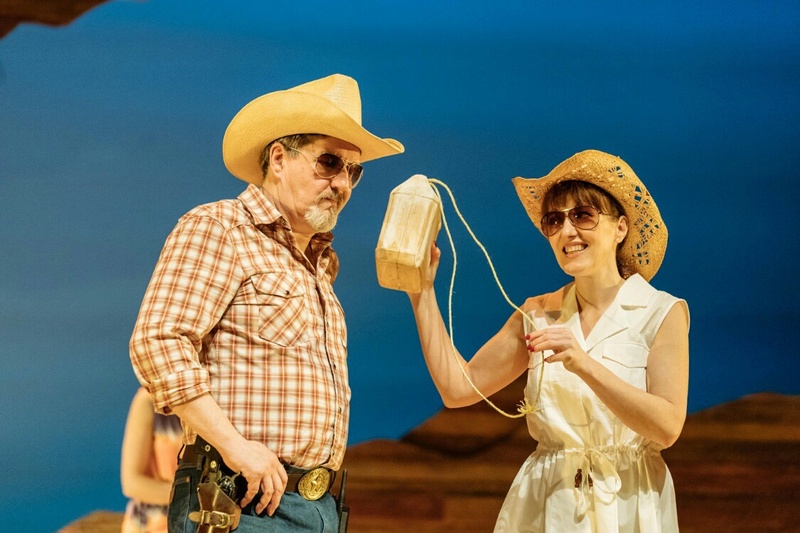 In Holes, we find ourselves happily immersed for two hours stage traffic in the blistering hot world of the Texan sun and in the company of a range of fascinating human characters plus puppet snakes, tarantulas and deadly yellow spotted lizards. The real life lizards have eleven yellow spots which are hard to see in their colouring, black teeth and white tongues. They live in holes and can leap out of, even very deep holes, to attack their prey. Stanley and his friends had better watch out! Drawing upon the essentials of the story in the book and a variety of themes such as fate and free will, justice and judgement, life choices, power abused, human transformation, family history, racism and man and the natural world, we witness the adventures and mis-adventures of one Stanley Yelnats (Chris Ashby). Accused of stealing some high cost trainers he is sent to Camp Green Lake for punishment and correction which includes digging pointless holes in terrific heat. For all the young incumbents at Camp Green Lake there is a reward for anyone who finds anything unusual whilst digging in the baking hot sun. But, they also have to deal with bullies and the dreadful Mr Sir (John Elkington) and even more dreadful female Warden (Kacey Ainsworth). Feared by all are the afore-mentioned deadly poisonous yellow spotted lizards. With most of the ten strong cast playing three or four roles, with some very quick changes, the action is very slick and constantly engaging throughout both acts. The story travels back and forth in time with important reveals along the way. Cast members Kacey Ainsworth, Chris Ashby, Ammar Duffus, John Elkington, Edward Harrison, Safiyya Ingar, Greg Lockett, Peter Lunkuse, Henry Mettle and Elizabeth Twells work very hard and with great imagination to tell Stanley’s story with clarity and a great deal of humour. 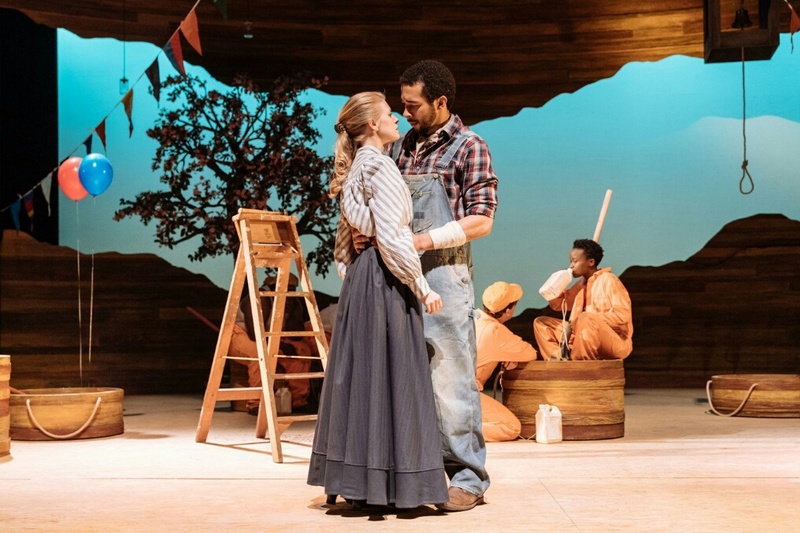 This press night audience made up of folk both young and older are continually transfixed by the happenings on stage and the evening slides easily by, giving everyone, with or without familiarity of the book or film of Holes a very satisfying night at Nottingham Playhouse. 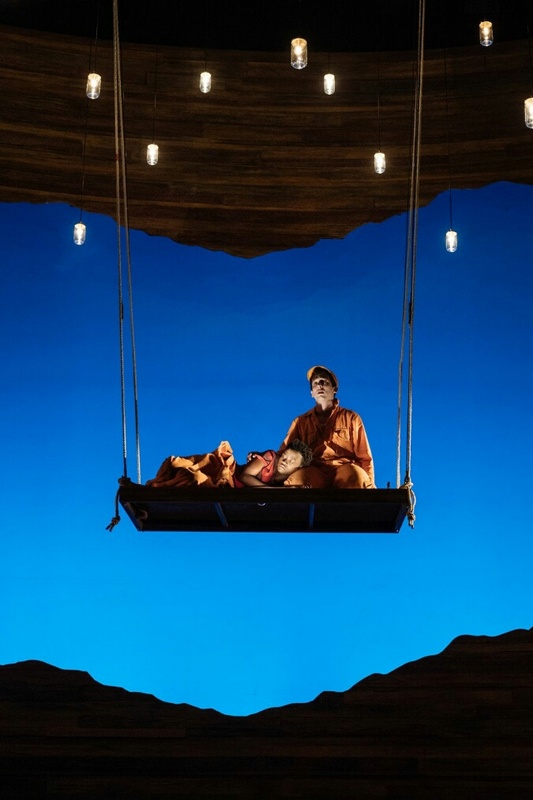 The set itself (set designer Simon Kenny) has a ‘rough aesthetic’ being suggestive rather than literally depicting locations and furniture and this aspect adds enormously to the fun, enjoyment and impression of the piece. Director Adam Penford, in the programme notes, says that this method of presenting Holes on stage works best ‘because, it leads you to be inventive and theatrical’. The lighting design for Holes is by Prema Mehta, the sound and additional music composition is courtesy of Adam P McReady for Poetical Machines Ltd and the composer is Tom Attwood. There is puppetry in the show and the puppet director puppet co-designer is Matthew Forbes. The fine second act hoe down choreography and additional choreographic work is from choreographer Emma Annetts. Will Stanley survive Camp Green Lake and find out if the family curse is as real as he believes it to be? Git yerself down to Nottingham Playhouse and find out these things and more right now pardners! You won’t regret it y’all.